Having planned this cruise for many months I was dismayed - to put it mildly - when about an hour before my scheduled pickup time by SuperShuttle to take me to the World Cruise Center in San Pedro I received a telephone call from SuperShuttle informing me that at they had NO vehicle available to me and that they were cancelling my ride! My next thought was to try to get an Uber ride instead but, not having any experience with Uber, I was not sure how to pursue it. With the minutes fleeing by I went next door to ask Nina who I knew had used Uber for advice. It seems that Uber relies totally on the use of cell phones, which I do not have. Nina immediately found me an Uber ride, arriving within 10 minutes, just enough time to turn off my TV and lock up my house. An Uber arrived very soon and I was off only a few minutes later than my original departure time of 9 am with SuperShuttle, arriving at the World Cruise Center and my ship, Holland America’s ms Amsterdam, at about 10:30 am. Almost no one else was checking in this early and I was checked in with no wait at all by 11 am, going into the waiting room until my group numbered 7 was called to board, which occurred just before noon. Very quick process! 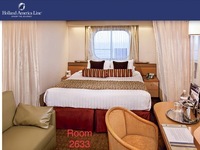 I easily found my upgraded room, 2633, on the Main Deck 2 and it was as to be expected - almost. About 2/3 back from bow of the ship, its location is about the best possible. One change I immediately observed on entering was the bathroom that had been substantially upgraded with the old-fashioned tub and shower combination now replaced with a beautiful and large glass-enclosed shower. My room on the ms Zaandam last July on my Alaskan cruise was identical - except for the bathroom. Since my luggage would not be delivered for a while I went to the Dining Room for a casual lunch, and a glass of wine - of course! Then I stopped by the Pinnacle Grill to schedule my two evenings’ dining at this specialty restaurant, pre-purchased beforehand online. Departure time for our voyage was to be at 5 pm and occurred shortly thereafter. With my luggage now having been delivered to my stateroom I proceeded to begin my unpacking, delayed by my 8 pm dinner in the Dining Room where I had requested a table of 4. However, it turned out that I was the only one at this table so the Maitre D’ suggested that I might prefer a smaller table for 2, which I gladly accepted. Unlike other cruise first nights, prime rib was NOT offered! Too bad! Expecting rough seas because of the recent stormy weather in Southern California, I was pleasantly surprised by the absolutely smooth seas and had no difficulty at all falling asleep in my very comfortable double bed on this, my first night aboard the Amsterdam, headed for the Panama Canal. The seas continue to be smooth as glass, much to my surprise but not to my disliking. With all of the stormy weather in Southern California, I had expected rougher seas. So far, so good! Being the first day at sea this was the first of three “gala”, or formal evenings during this cruise, so out came my coat and tie to wear. The day had been very relaxing with little to do except to complete my unpacking so I was ready for my dinner scheduled for 8 pm and it was not disappointing. I do not recall my menu choices but they were very good in any case. Then it was another early to bed; I am not the night owl I once was! On Wednesday, our second day at sea, I spent most of the day in my stateroom after enjoying yet another breakfast delivered to my room, which will be my normal habit, I think. Although yesterday I did go to the dining room for breakfast, it is so easy to just order in. I know I am missing all of the interplay with the rest of the passengers but, after 53 cruises, I quickly grow tired of hearing all about their grandkids, health problems, recent surgeries, etc., etc. Enough! That’s about it so far; I will have much more to report after tomorrow’s stop in Puerto Vallarta, Mexico. After another night of calm seas, our arrival in Puerto Vallarta was right on schedule, at 8 am. 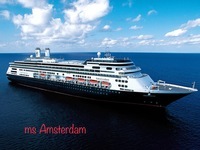 There was another Holland America ship, the ms Eurodam, also in port. It has been a few years since I was last here and I was amazed at the recent growth: new port facilities, numerous new high-rise buildings stretching all along the shore of Banderas Bay. My choice of tour for the day was “Best of Puerto Vallarta” departing at 9 am. This is a repeat from the last time I was here, and involved a walking tour of old downtown PV including a walk along the Malecon, or bay front, with all of the many bronze statues present there. The street along here is now restricted to a pedestrian one which was a wise change. We then had a short visit to the famous Our Lady of Guadalupe Cathedral that incidentally was my first there. Then it was back on the bus for the Tequila Factory part of our tour. The drive out of Puerto Vallarta, past the busy International Airport, was farther that I recalled, but soon we arrived at the familiar Hacienda Dona Engracia for our tour of tequila making, followed by tasting - yeah! - followed by a nice buffet lunch - including choice of beverage - beneath a large tent. My choice was a Margarita, of course! New this time was a performance by a talented group of two couples of fiesta dancers, performed on a center stage in the middle of the tent. Their dances were both quite active as well as exquisitely costumed. There was even a very talented ropedancer performing during a costume change for the dancers. All in all, a most excellent addition to this popular tour. Oh, did I mention the unlimited supply of Margaritas? A good time was had by all! Leaving the Tequila Factory, we returned at 2 pm to our ship, the ms Amsterdam, concluding a wonderful visit to Puerto Vallarta, Mexico. Tomorrow is another day at sea until we reach Huatulco, Mexico, on Saturday, so there probably won’t be too much to report. Another day at sea on remarkably smooth waters, I spent most of the day in my stateroom, again enjoying my breakfast delivered by Benny, in exchange for a customary $2 tip: black coffee, cranberry and orange juices, ham and cheddar cheese omelet along with hash brown potatoes and English muffin. I can wear my sweat pants and sweat shirt in the privacy of my room - all very laid-back and relaxing. I forgot to mention my dinner at the Pinnacle Grill, a specialty restaurant aboard, on the evening of the second day at sea, Wednesday, January 9th. Online I had purchased for $62 two dinners here, each regularly priced at $35. Starting with a shrimp cocktail of three enormous shrimp - easily the size of small lobster tails, my entree was a 10-ounce filet mignon steak, expertly cooked to medium rare and so, so tender! Dessert was a chocolate soufflé that was incredible. Enjoyable, to say the least! My other dinner here will be on our last evening at sea before arriving at Ft. Lauderdale on January 21st. Huatulco is our second port of call in Mexico, which I had visited on a previous Princess cruise years ago. Today my choice of tour was a “beach break” at one of the many new resort hotels now populating this once-small port, the Secrets Resort. After a small coach ride of about 30 minutes, we arrived at the resort’s gate and were temporarily delayed from entering until proper identification was made. An enormous new resort with many levels leading down to the perfect, crescent-shaped Conejos Bay, the open lobby with high ceilings greeted the 12 of us in our group. After a brief explanation of the facilities and what was available to us, we were allowed the use of all of this inclusive resort’s offerings, including restaurants, pools, beach, and bars. My first choice was a trip to the Castaways Restaurant, located at some distance from the lobby and accessed by means of a small shuttle. I was about 5 minutes early for their 12-noon opening but was soon seated at a table in this open-air luxurious establishment. Ordering a Margarita on the rocks I relaxed immediately for a leisurely lunch. The menu was presented on a large billboard placed near my table and my choice was a rib-eye steak following delicious guacamole and salsa dip with chips. The steak was prepared to perfection as medium rare, and was absolutely delectable! A dessert of coffee flavored mousse topped off my “lunch”. A short shuttle ride brought me back to the lobby where I began looking for the pools. An elevator took me down to the lower level where a variety of beautiful pools were located and, unfortunately, the lounges were already fully occupied. So I sought out a nearby beach bar and ordered more Margaritas. After the two I had enjoyed with lunch, I enjoyed two more here! On the way back up to the lobby I stopped for yet another drink at another open-air bar, enjoying the coolness of it all. We were to meet in the lobby at 3:30 pm for our return trip to the ship, so I went back up to the lobby just after 3 pm, not wanting to be late. There I found yet another bar offering me yet another Margarita while waiting. Others in our group began to appear and 3:30 pm came and went with no sign of our coach back to the ship. Finally, around 4 pm, one arrived - not the same one in which we had been brought here. Evidently through some mix-up, our original coach had been cancelled and another replacement made. Never the less, we were delivered back to our ship, almost on schedule. All in all, a very enjoyable - and liquid! - day in Huatulco, Mexico. Tomorrow we are to be docked at Puerto Chiapas, Mexico a first visit for me. Being my first visit to this small port of call, I had chosen a tour to the Argovia Express: Coffee Tasting and Botanical Gardens for the day. Nothing much else exists at this port except for a new elaborate cruise center. So I was dismayed to be informed the evening before that, due to low participation, this tour had been cancelled! Other tours were offered in replacement but none to my liking, so my visit to Puerto Chiapas was aborted; I chose to stay on the ship all day. Thus, my day was spent much the same as a sea day, relaxing in my stateroom. With ports of call for each of the next three days, the loss of this day was not too great. Originally I had booked a tour just to the old city of Antigua but, having my previous coffee tour cancelled, I decided to change to a tour that would also include a visit to a coffee plantation: “Coffee Estate & Antigua”. Leaving the ship around 8:30 am we traveled on a very new coach for 90 minutes to the Filadelfia Coffee Estate on the outskirts of Antigua where we were given an informative tour of different portions of the estate: nursery, drying areas, mills, and packaging. Then we were invited to a lunch at the estate of an expertly prepared strip steak along with guacamole, black beans and rice, followed by a delicious coffee flavored mousse. Of course, a cup of their finest coffee accompanied this substantial meal. I heard NO complaints at all! Then we were given the opportunity of shopping in their small shop; for me, a bag of their coffee! Switching to two smaller vans, now required in the city instead of the large coaches, we then proceeded into the center of Antigua where we were given a somewhat lengthy walking tour, ending at the city square and the large cathedral. My legs are still crying out in pain! Finally, back again on our large comfortable coach, we spent another hour or so returning to the port and our ship at 4:30 pm, a long, enjoyable albeit energetic day. It was so good to return to my comfortable stateroom for a rest before preparing for dinner. My tour today was first to the ancient ruins of the original capital city of Leon, destroyed by a volcano and seismic activity in 1610, covering it completely, and becoming the “Pompeii of Central America”. Rediscovered in 1967 it is now a World Heritage Site. It involved walking around the several acres observing walls or parts of walls still existing. The destruction was so severe that it was decided to relocate the new city elsewhere. All very interesting if you are into archeology but with all of the walking with not too much to see, my boredom reared its ugly head - in addition to my also sore legs. Returning to the entrance we were treated to an enjoyable and delicious Nicaraguan lunch in a local restaurant, consisting of chicken, steak, rice and beans, along with crispy fried plantains (bananas). A welcome relief from our walk! We then proceeded on for another hour to the modern city of Leon, traveling through very interesting and scenic country, including many volcanoes, most dormant but some still active. Mount Momotombo is the largest volcano and steam clouds could be seen coming from its cone-shaped summit. In the “modern” (really colonial) city of Leon, we were let off our coach near the city square and given a tour of the monumental cathedral there; it is immense! The interior is quite impressive with the many arches, altars and artwork. We were given the opportunity of climbing the 85 steps to the bell tower from which a magnificent view is possible. OR, if not, visiting a nearby restaurant for a cooling beverage; I chose the later! Finally it was back on our comfortable coach for the hour-long drive back to the port and our ship, arriving again about 4:30 pm along with several other buses at the exact same time. Getting back aboard became a lengthy process. Again, it was SO good to be back in my stateroom to rest my weary legs. Tomorrow in Costa Rica there will be MORE walking! This will be my 5th visit to Costa Rica and it remains one of my favorites. Seeking to try something different as far as excursions, the one entitled “A Walk in the Clouds” caught my attention, and it did live up to my expectations, although my poor legs might disagree. Leaving the ship at 9:30 am our coach departed the port of Calderas, one of the two Pacific ports for Costa Rica, the other being Puerto Arenas, about 20 miles away, and began our slow but gradual climb up into the range of mountains, their tops covered by clouds. Eventually we will have climbed to over 4500 feet above sea level and be right among the “clouds”. The drive was quite pleasant with the vistas right out of a picture book. We drove through several small towns, coffee plantations, and past many luxurious homes. Finally arriving at our destination, the Finis Nature Conservatory, amid a thick cloud cover, our first stop was for the rest rooms. Then after a short orientation talk by our tour guide we were separated into two groups for our trek. The group I was in was assigned a young enthusiastic naturalist student who was excellent in his knowledge of everything we would be observing. Our first stop was a nearby butterfly enclosure into which we entered and saw dozens of the fluttering insects. One in particular was a very large butterfly with bright blue wings, and whose name escapes me. Our guide explained all of phases of a butterfly’s life that I found most interesting. Next we came upon a suspension bridge, one of many that we would be crossing, high above the canyon and definitely a bit scary! We then proceeded to hike down and down along a trail marked with many stair steps, toward the small river below. A thick cable alongside the path aided tremendously in steadying our progress. More suspension bridges were encountered and eventually we reached the creek at the canyon’s bottom. A spectacular waterfall could be seen nearby and it was here that we encountered the other group having traveled in the opposite direction. Then came the hard part: going back UP the other trail, back to our starting point. My legs screaming out to me, my main problem was breathing and exhaustion but with several rest stops, I made it to our stop near the top where many hummingbird feeders were located. Hundreds of these tiny and colorful birds flittered all around, helping themselves to the feeders. Our guide then explained a lot about the different kinds of hummingbirds present, their habits, and aspects of their lives. Then it was only a short distance farther to our starting point where our lunch was waiting in a large open-air building. Lunch consisted of a buffet offering chicken and beef along with salads, rice and black beans. A delicious berry drink completed our hard-fought-for repast. Then it was time to reboard our coach for the trip back down to our ship. In one of the towns through which we had passed, a brief stop was made for shopping at a large store that offered many souvenirs of Costa Rica, including many coffees for which this country is famous. I purchased a bag of Cafe Britt Dark Roast coffee beans for $17; rather expensive I thought. On previous trips to Costa Rica I had toured the Cafe Britt Coffee Plantation in San Jose and had purchased coffee from them there and on their website. I don’t think I paid so much then! Our tour guide decided to take us by way of a different route back to the port and our ship and we passed through many small towns on the way. In each, he pointed out the presence of a Catholic Church, a school, and a soccer field. Costa Rica has one of the highest literacy rates of any country in the world, largely in part to their elimination of a military many years ago, the resulting emphasis then being placed on education. Right on schedule at 4 pm we arrived back at our ship, this time being the only tour getting back. There was an ambulance at the gangway, most probably some passenger had had a medical emergency; I never found out. As always, it was a relief to get back to my stateroom for a rest before dinner at 8 pm. Another full day at sea was required for our travel on to the Panama Canal from Puerto Calderas, Costa Rica, and about the only significant activity of the day for me was the “Gala” or Formal Night. As usual I enjoyed my in-stateroom breakfast, delivered by Benny - who gladly accepts my daily $2 tip: ham and cheddar cheese omelet with hash browns, coffee and juices (cranberry and orange). Finally, our Gala Dinner included “Surf & Turf”, fillet mignon and lobster tail, all very good with my steak grilled to medium rare perfection. Dessert was a Peach Crisp, served with a scoop of vanilla ice cream. Yum-yum! Our approach to the Panama Canal started quite early on Friday morning with our passing beneath the Bridge of Americas occurring around 6:30 am. With the many towers of the very modern Panama City visible in the distance to the right, and the cranes of the port along side our approach in the channel, we reached the first set of locks, the Miraflores Locks, about 7 am. Passing through this set of two locks took about an hour putting us in the small lake leading to the second lock, the Pedro Miguel Lock, about 8:30 am. The new set of locks recently opened are located to the left and consist of a set of three locks, much larger at 1200 feet long and 150 feet wide, than the original locks at 955 feet long and 106 feet wide. Once past these locks we entered the portion of the Canal called the Culebra Cut where the majority of the construction excavation took place. A relatively new bridge spans the Canal just before this entrance, and is a stunningly beautiful modern structure. Materials removed for this Cut were used to build the Gatun Dam across the Chagres River, creating the Gatun Lake, one of the largest lakes in the Western Hemisphere, and supplying the constant source of fresh water used in the locks. At around the middle of the Canal, before entering the Gatun Lake, we passed by the port of Gamboa at about 10:30 am where much of the maintenance equipment for the Canal is located. Then it was on into the large Gatun Lake for the lengthy passage across to the final set of locks, the Gatun Locks, arriving there around noontime. With three locks, the transit of the Gatun Locks took almost 2 hours. The newly opened set of three locks is located to the right side of the original Gatun Locks, and the super structures of the immense cargo ships using it could barely be seen over the trees. While in the midst of our ship being lowered from one lock into the next, we observed huge cargo ships being raised in the adjoining locks, some stacked so tall with containers as to strain one’s imagination! And yet they were able to use the original locks! One last such cargo ship entering the Canal southbound through the Gatun Locks appeared to be a car transporter because of its huge solid side walls and a ramp on its rear. Gigantic! After returning to the sea level of the Caribbean Sea, we further transited a channel into the Sea, passing beneath an almost-completed new bridge across the Canal, a beautiful new modern bridge not unlike the one crossing the Canal just prior to the Culebra Cut. Entering the Caribbean Sea, the port city of Cristobal was just off the right side. Once we took a cruise on the Grand Princess that, being too large to transit the Canal, ported us here; we then took the train across the Isthmus to Panama City. This railroad predates the Canal by many years and only takes an hour or so to make the trip alongside the Panama Canal. Our entrance into the Caribbean saw the end of our smooth seas; that evening was quite bumpy, a indication of rough seas to come. One good finale to the day was the serving of delectable prime rib in the restaurant that evening. My slice of prime rib was one of THE BEST I have ever enjoyed! Tomorrow: Cartagena, Columbia, our last port of call. After a night of active sea action, our noon arrival in the huge bay of Cartagena was a relief from the bumpy ride from the Panama Canal. The newer part of this ancient city is resplendent with high towers, mostly residential. On the other side of the bay is located the remnants of the old walled city, walled for protection from the pirates of old. Our ship docked at the main pier to the right of this section, next to another ship, the Monarch, one of Pullmantur’s fleet. The tour I selected for our afternoon in Cartagena included first a catamaran ride from near where our ship was docked, requiring a somewhat lengthy walk, around the bay past the towers on the peninsula to the left and the older section to the right, passing the Colombian Navy installation, finally docking alongside a dock near the walled city. Disembarking the catamaran we were immediately besieged by hordes of street sellers, selling everything from jewelry to hats to T-shirts to water, ... Having been here twice before, I was prepared for the constant barrage, just saying “NO!” repeatedly. Crossing a busy street we came alongside a proportion of the old wall, to an opening that we entered and proceeded with our waking tour of this older part of the city, around the very narrow streets and visiting several plazas. One special plaza was dedicated to Simon Bolivar whose statue adorned the center of the square. A cooling breeze largely compromised the reported high temperatures for the afternoon. Otherwise it would have been miserably hot. Much shade was also provided by the buildings being so closely packed together. We passed by a very elaborate building that had been the one time home of Sir Francis Drake, now available as a high rent hotel. Most buildings facing the narrow streets contain central courtyards with trees and fountains. Also observed was the old cathedral although we did not get to enter. Proceeding around several blocks we eventually returned to our original entrance where a tour of an emerald museum was offered. Entering we were presented with a mock-up of an emerald mine and a museum guide told us all about emerald mining. According to him, Columbia is the largest and best source for emeralds in the world. Of course we were eventually lead into their showroom where emerald jewelry could be purchased. I bought nothing! We were then given an hour or so of free time and, when I asked our tour guide for a good place to get a beer, he indicated a stairway leading to a very nice restaurant just above the emerald museum, where I found a table on their balcony overlooking the square below. Excellent location! After two beers I felt hungry so I ordered a shrimp dish that turned out to be absolutely delicious! And a third beer, of course! When the check arrived, the total - in pesos - was 69,000! Putting it on my Alaska Airlines Visa, this huge total amounted to just over $20. Rejoining our tour group at 4:15 pm, we all then proceeded back to where our catamaran was waiting and boarded for the return boat ride back to our ship. Upon arrival we were offered a free shuttle back along the dock to our ship’s location, fortunately! My poor legs were complaining! As always it was good to again be back aboard and in my stateroom. The ms Amsterdam departed Cartagena at 6 pm. Once past the harbor entrance, the sea action began again and continued through out the night. The next day was another sea day, one of two until our arrival in Ft. Lauderdale on Tuesday morning. My day was as usual, having breakfast in my room, and writing some more on my cruise journal. As the last of our “Gala” nights, I again dressed for dinner in coat and tie. It was a surprise that we again were presented with the same menu as for our previous formal night, “Surf & Turf” which I gladly enjoyed once again, beginning with a generous shrimp cocktail. Staying up way past my bedtime, I waited up to observe the lunar eclipse of the “Super Moon” that occurred around 10:30 pm. My location on the ship for viewing was in the Crow’s Nest Lounge on Deck 8. The full moon was directly overhead as I sat near the front of the lounge. Very cool! Tomorrow I am invited to the Captain’s Reception at 12:30 pm for the Mariners Society, Holland America’s loyalty group of repeat customers, to be followed by a special luncheon in the Dining Room at 1 pm. We will no doubt be receiving the traditional Delft tile from HAL. The seas had calmed down quite a bit during the day and I went to the Main Stage Theater for the Captain’s Mariners Society Reception at 12:30 pm where I encountered a huge crowd; Holland America has a great repeat business. After struggling to receive my free glass of champagne - I didn’t sit in the right seat! - I did enjoy viewing the many awards to several passengers, mostly quite old, for their unbelievable numbers of cruises taken. My 10 cruises and 129 days had already received a Bronze Medallion on a previous HAL cruise, so I was not individually recognized. Following the Reception we all moved to a special area of the Dining Room for our Mariner Society Luncheon, including wine! Luckily I sat at a table with my new friends, Pat & George, from my many visits to the Ocean Bar on Deck 5. My menu choice was a delectable filet mignon, cooked to perfection - medium rare, and so, so tender! The Captain spoke once more and everyone seemed to enjoy themselves a lot. Dessert was a delicious berry cheesecake that was outstanding! All in all, a very nice experience. Then it was the most dreaded time of any cruise - packing up to leave! However, over my 54 previous cruises I have become adept in the accomplishment of this duty so my luggage was almost completely packed by late afternoon, needing only the clothes and dopp kit required for getting ready for my second evening dining at the specialty restaurant, the Pinnacle Grill at 7 pm. I had delivered extra tips to my waiters and wine steward in the dining room the previous evening, so only remaining were my favorite bartenders in the Ocean Bar, and my two room stewards that I would deliver tonight. For a cruise of this length - 15 days - I usually give them each $20; this is in addiction to the automatic tip of $13.50 charged daily to my shipboard account that is distributed to all service staff - they say! I often wonder how much of this substantial amount actually reaches the intended people! As usual I went to the Ocean Bar before dinner where I said my goodbyes to both Suvit and Mervin - both from the Philippines, as well as to Pat & George from Virginia with whom I had become good friends. Then it was off to the Pinnacle Grill for my last meal aboard. My appetizer again was a cocktail of HUGE shrimp - 4 of them, and almost as large as small lobster tails. SO GOOD! And again I chose the 10-ounce filet mignon, grilled to perfection at medium rare, accompanied by side dishes of creamed spinach, mushrooms and grilled asparagus. I ate every bit of it! For dessert I enjoyed a berry Baked Alaska, sufficient size to serve two, but again I finished it off! What a final dinner! Then it was reluctantly back to my stateroom to finish my packing that was done quickly, adding my dinner clothes and dopp kit to my luggage, being careful to leave out clothes to wear in the morning. In addition to my one suitcase I also use a Princess tote bag to carry my iPad, head phones for the airplane, passport, and a SuperShuttle confirmation sheet, along with American Airlines boarding passes which I had earlier printed in the ship’s internet center. All done, I placed my locked and tagged luggage in the hallway for pickup before midnight; mine was out by 10:30 pm. Special tags indicating departure group from the ship had been issued - mine was Yellow 1, and I left right on schedule at 8:30 am for the Ft. Lauderdale Airport and my 1 pm flight to Charlotte, NC, there changing planes for Los Angeles. Of course I missed my usual breakfast room service on the morning of departure, but waiting in my stateroom until my group color was called allowed me to sleep in until around 7:30 am. Departure was through the forward exit door on Deck 2 so it was most convenient for me since my stateroom was 2633, on Deck 2. A special parting touch of this cruise was the lineup of crew members at the exit as we left the ship, all bidding us farewell and thanks for choosing Holland America. I don’t recall anything like this on previous ships. Very nice! After the long walk in the terminal to the baggage collection hall, I found mine quickly and showing my passport to the emigration control agent allowed my exit to the awaiting airport bus located at the entrance. First telling the driver my flight airline - American Airlines, I went aboard and relaxed for the short drive to the airport, very nearby the cruise ship terminals at Port Everglades in Ft. Lauderdale. Arrival at the airport was around 9:30 am and, after a short walk from where the bus dispatched us for American Airlines to the terminal, I quickly checked my luggage with an outdoor agent, not having to pay the $25 fee since I have an AAdvantage Visa card. Inside I found NO lines for security check in and rapidly made way through TSA Pre Check with no delay. Then it was off to find my departure gate E5 and then a nearby restaurant to eat breakfast. Luckily there was a Jack Nicklaus restaurant right next to Gate E5 and, after a short wait for a table, I ordered an immense 3-egg omelet loaded with mushrooms, onions and sausage, served with hash browns and wheat toast: and coffee, of course. Since my flight was not until 1 pm with boarding at 12:30 pm, I had a very enjoyable and relaxing breakfast, sitting there watching all the hordes of people now passing by; the terminal had gotten quite crowded since my arrival. With my Main Cabin Extra Seat on American Airlines, I receive early boarding so just on schedule I boarded Flight 1924 for Charlotte and found my assigned bulkhead seat 5C with no delay. Then I got to watch as the plane filled, all passing right by me. After a bit of bumpiness on take off, the rest of the 2-hour Flight was remarkably smooth and our arrival was almost 30 minutes early, which caused some delay in finding an open gate; the one originally assigned was still occupied. Deplaning in this very large and busy terminal of Charlotte, a hub for American Airlines, I located my departure gate for Los Angeles and was dismayed to find it to be Gate B14; our arrival gate had been at Gate C5. So away I went, riding the many moving sidewalks, until finally I reached Gate B14, at the very end of B concourse. Upon arriving I read that boarding would begin in 15 minutes! Very close connection with the gate change. Boarding was actually delayed by our aircraft arriving late and our eventual departure for Los Angeles was not until 4:20 pm. Again I boarded right away and got to my seat 5C right away. The flight was in fact overbooked and the boarding agent was asking for volunteers to take a later flight; I did not do so! An almost 5-hour flight, I enjoyed a Chardonnay wine twice during the flight that was really quite smooth with only few short periods of minor turbulence. Sleep for me occurred in short patches during the flight and I was happy when our final descent into LA began. There was some turbulence as we passed over the Banning Pass moving our plane about, but the landing was smooth. We landed on LAX’s north runway and had to circle the airport, around the new construction area, past Bradley Terminal, until finally reaching our Gate 42B. First stopping at the nearest bathroom, I then proceeded to locate our baggage carousel that turned out to be Number 4. I was lucky to see my luggage come around very soon and, with a struggle to get it off the carousel, I was then off to find SuperShuttle’s dispatcher for my prepaid ride home. I found the dispatcher’s desk vacant and waited for the next SuperShuttle van to come along. With some confusion, the van for John Wayne Airport eventually took me aboard, along with 4 others seeking transfer to Orange County, so I expected it to be another lengthy trip; I was actually the third one delivered, at about 9:15 pm. The end of a long, exhausting day of travel. Struggling to find the right keys to open my front door, finally I was inside and immediately turned on my heater. Everything looked just fine after 15 days of absence, and it was so, so good to slip into my own bed last night. Today, Wednesday, it could not be more beautiful outside and I put the garbage cans out for their regular collection. My luggage full of dirty clothes will just have to wait!